How does Italy’s budget fit with EU fiscal rules? 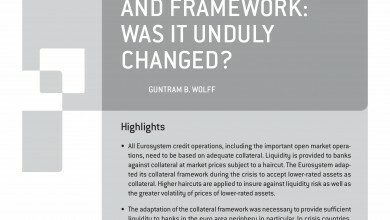 In this Director’s Cut of ‘The Sound of Economics’, Guntram Wolff welcomes Bruegel research fellow Grégory Claeys to assess how the new Italian budget proposals measure up against the existing EU fiscal rules. Italy’s new budget proposals, together with projected deficit levels for the coming years, have put the EU as well as bond-market investors on alert. In the context of Italy’s already-high ratio of public debt to GDP, the coalition government’s plan to increase the budget deficit has prompted concerns that the country risks running afoul of the EU’s fiscal framework. What are the means by which the EU can monitor and, if need be, administer sanctions on Italy, in the event of any contravention of its fiscal rules? Bruegel director Guntram Wolff takes this opportunity to discuss all the options facing the European Commission and Council, as well as the specific details of the Italian case and the forecasts underpinning the budget’s figures, with Bruegel research fellow Grégory Claeys. For further reading, we recommend our full break-down of the EU’s options for response to Italy’s fiscal plans, written by Grégory Claeys and Antoine Mathieu Collin. Previous Post The Italian government budget proposal for 2019Next Post How could Europe benefit from the US-China trade war?